For a lot of people October is a sad month, full of regrets for our past summer. But for me it is the sweetest time of the year. This is the month when the best harvesting takes place: the juicy apples, the rich grapes and the sweet chestnuts. In the past, harvesting was not only hard work but also a time of celebration: the last fatìgue before the winter. And while the wheat crop was an adult business, picking up fruits always involved the children, who were more than happy to help, knowing that it was an easy access to tasty extra food. I have got happy memories of warm and bright afternoons in my aunt’s vineyard, hours of work but full of laughs and joy, while picking up lusty bunches of grapes. My childhood is full of October Sundays in the wood looking through the husks, competing with friends on who could find the biggest chestnut. I was lucky because I used to live near Combai, one of the best places where to find this huge kind of sweet chestnut. 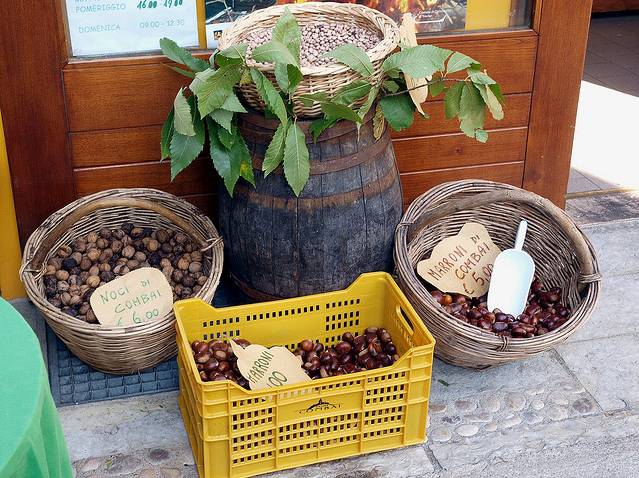 In this little village, 40km north from Treviso, throughout October the Festa dei Marroni takes place. Planning a trip there is an opportunity to learn about the historical and artistic beauty of the area, to discover the beautiful autumn colours and landscapes, to browse through the traditions and sample the culinary gems that this area can offer in autumn. 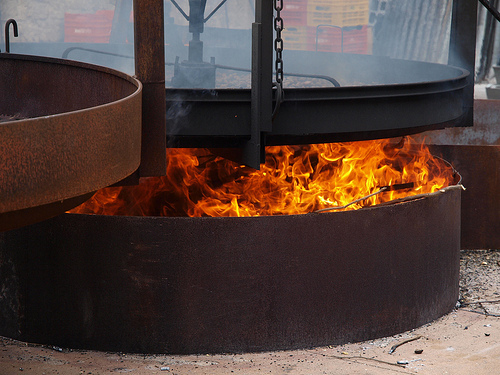 During the festival, along the streets of Combai you can enjoy performances related to the trades of the past, as well as taste this peculiar kind of sweet chestnuts, here called marrone, roasted in the gigantic "rostidore" – the huge roasting grills - or be tempted by the different sweets made with chestnuts or chestnut honey, perhaps accompanied by the must of newly harvested grapes. Combai is located in a splendid panoramic position, nestled at the foot of the Alps, surrounded by majestic chestnut trees and vineyards. From the town centre depart several natural trails that give you the opportunity to immerse yourselves into the truest nature. They have evocative names, like: Sentiero dei Marroni or Strada del Verdiso. The current area of ​​production of the Marrone di Combai extends over a wide area – 274.69 km2 - which coincides with the administrative boundaries of 11 of the 16 municipalities belonging to the mountain community of Treviso Pre-Alp. The geographical indication PGS - or IGP, Indicazione Geografica Protetta in Italian - is reserved for the type of sweet chestnut fruits, genus Castanea, species Sativa, subspecies Domestic macrocarpa, local ecotype Marrone di Combai.The physical and organoleptic characteristics of the Marrone di Combai are closely related to the geographical environment of production. The topography of the area and the characteristics of soils are the main factors that make this area especially suited for this kind of sweet chestnut. The presence and the particular quality of the chestnut trees in the area that goes from Segusino to Cordignano and which has Combai at its center, are confirmed by numerous historical evidences dating back from the twelfth century. The historical records, covering the period of time ranging from 1200 to 1700, identify the foothills of Treviso, to the left of the river Piave, as an area naturally suited to the development of the chestnut. To protect and carry on the production of this fruit the Pro Loco of Combai started this Festival that - since 1945 - constitutes an event of great importance locally and nationally. The area is full of lovely places to go. A few steps away you can enjoy the Cistercian Abbey of Follina (XII sec. ), the Brandolini Colomban Castle at Cison Valmarino, the ancient church of San Pietro di Feletto, the feudal castle of Collalto in Susegana, the Shrine of Our Lady of Mount Carmel in Miane and a must-not-miss drive along the Prosecco Wine Route, passing through the towns of Conegliano and Valdobbiadene. After you have spent an entire week-end picking up, roasting and eating you can understand why for me autumn is really here only when I can feel the smoothness of a castagna in my hand.